It was just five after the launch of the Mini that the first Moke rolled out the factory. 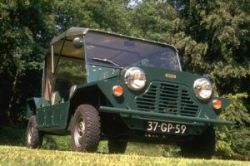 The end of this production story was in 1993, when the last Moke was made. 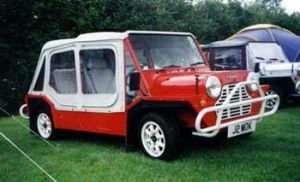 The Mini Moke was designed by Sir Alec Issigonis, the same time the Mini Saloon was. 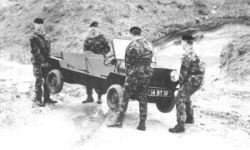 The first prototype was developed in 1959 to meet a need in the British Forces, it went through a number of different prototype models over a period of five years. 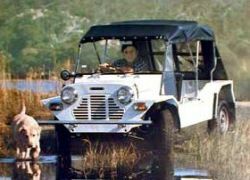 One of them included the 4WD Twini-Moke, a two engine model. Unfortunately they didn’t make much favour with the British forces, they complaint about lack of ground clearance, particularly below the engine. Although in 1960-1961 some Mokes did find there way to the British-, American-, New Zealand- and Australian Army. These models are of course a bit different to the one we see today, like side windscreens, wheel-base, sump-guard and engine performance. 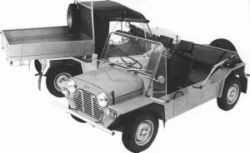 The first production Mokes were assembled in 1964, at Longbridge Birmingham. From 1964 till 1968 there was a production of 14.518, and only 10% staid in England. Depending on the dealer were you bought from, you got an Austin- or Morris Moke. Total production of these models was 9.096 Austin and 5.422 Morris Mokes. The Mokes came in one colour only (Spruce Green) and just a driver’s seat and 1 wind-screen wiper, the rest was optional. It had an 845cc engine and 10inch wheels, called “little wheeler”. In 1966 BMC also opened a factory in Sydney (Australia) to produce the Mokes. The total production moved in October 1968 to Sydney. Here they came up with major changes in function of the local circumstances. First an 998cc engine followed by a 1100cc and later the 1275cc. The body was strengthened and better seats were placed in. Other changes were the brakes, wiring the exhaust and they were fitted with 13inch wheels to give better ground clearance. These “Californian Mokes” got many recreational interests, and soon even a pickup model was launched, all fitted whit denim hood, floor mats and bull-bars. Production in Sydney was ceased in 1982 and Peugeot took over the plant. In 1983 Leyland started production in Portugal, too fulfil the needs of more orders. These Mokes were made on the base of the Australian models, fitted with a standard roll-cage. Problems soon began to appear in the factory, so Jim Lambert was sent to Portugal to sort everything out. 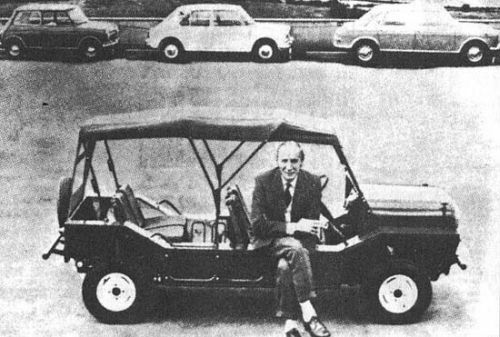 He started a new factory and in 1986 this developed into the New Moke, with a return to more standard Mini parts to reduce the costs. 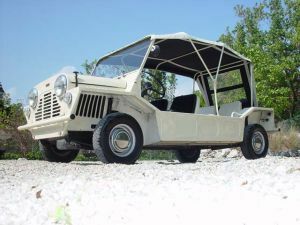 The Mini Moke was reborn, with a 998cc engine, 12inch wheels, side-screens and a luxurious interior. In 1989 Austin-Rover stops production and the rights for production are bought by Cagiva (Italy). They almost produce the identical models, even in the same factory, changes now were refinements on seats and hood. And for the first time in Mini production the radiator was fitted in front of the engine (behind the grill). Options available included new rounded bull- bars, Minilite wheels, metallic paint and tinted windscreens. Overproduction in 1992 let to the halting of manufacturing in the early 1993 and the closure of the factory in Portugal, with parts and tools being transferred to Italy. And so the story of a great one ends. Factory in Sydney opens doors. 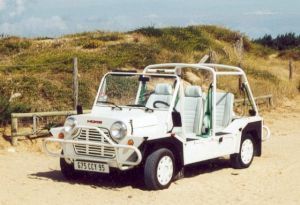 The first Australian Mokes are made under the name BMC Mini Moke. Production of both versions of the Mini Moke ceased at Longbridge. Moke Californian launched with 1,275cc engine, two-speed wipers, hazard flashers, reversing light, spare wheel cover and rear-mounted fuel tank. Cost: $1,675.